The luminous blue of the preamplifier's display and of the LEDs indicating that the amplifiers are switched on, set against the aluminum of the front panel and of the whole chassis of this vaguely alien-ish amplification triptych (not to mention the unusually shaped remote) evoke a strange and contrasting sensation of "whimsical hi-tech". "Cold" colours predominate, here, but this is misleading. The amplification system's heart is decidedly "warm", since we're dealing with a pair of Class-A monoblocks and their dedicated preamplifier. We're talking about Cairn, a French company - relatively young (Est.1994) yet pretty known in the Hi-Fi world. The products on test are its K1 Class A amplifiers with matching Nanda North Face preamplifier. The firm's production focuses on electronics, and in its catalogue you can admire four power amplification systems (K1 class A, Mea, Loco, and the soon-to-be-released Sumo), all strictly monoblocks, a preamplifier (Nanda), an integrated amplifier (the 4808 class A model) and a CD player (Fog 2). The K1 Class As are rather heavy, yet not excessively big. Their aspect is pleasant, with a clean façade featuring only the switch and, above it, the blue LED that indicates its operational status. On both sides are located the mandatory and appropriately sized heatsinks, whose edges are unfortunately so sharp that they can cut you. On the rear panel are placed the inputs (balanced and unbalanced), a double pair of output connectors to meet your bi-wiring needs, and the IEC power cord socket. The cover sports six round holes, helping heat exchange, closed by a metallic grid. 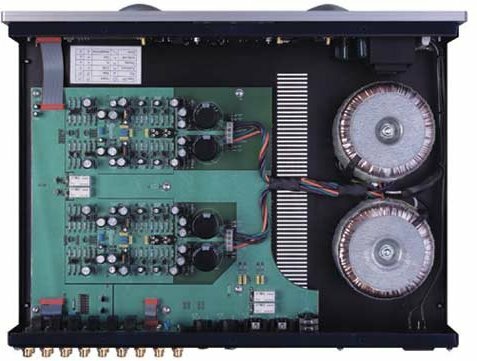 With a similar aspect, the Nanda NF (North Face) preamplifier looks more busy and futuristic, due to its two big "dome-like" knobs positioned on the front panel. Their diameter is the same as that of the centrally-placed display. It is an LCD display, with automatic switch off after some time, on which you can read all the information needed for operation (selected source, volume level, balance, etc.). The preamplifier can be used also via its own remote control, the Roc 2.0, a strange aluminium cylinder, with a series of little metallic buttons placed along a circular line on its top. 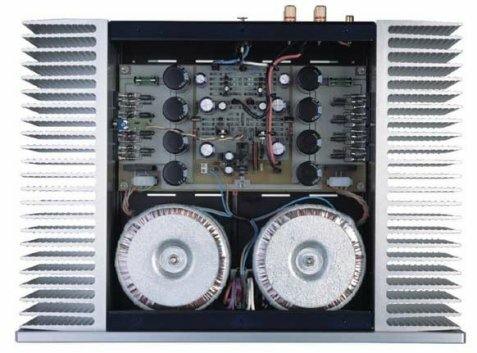 The Nanda's structure is totally dual mono, with a gutsy power supply, sporting twin toroidal transformers. There are five unbalanced inputs, all line-level, and the tape loop. On the rear panel you can also find a double unbalanced pre-output and the headphones socket. Balanced inputs and outputs, and IEC power cord receptacle complete the connections of this device that remains on standby while connected to the AC. During my listening, I can easily recognize the positive characteristics that good class-A amplifiers usually display. I am talking about inter-instrumental silence by which the dynamics and harmonic content of delicate sounds are sharply punctuated, and become real with their own definition and light, being brought to life so naturally that the listener can feel a very enjoyable sense of realism. You can experience a marked impression of cleanness, due to an ambience characterised by very good liquidity, where the sound is sweet and smooth, absolutely non-grainy and completely free of harshness. Thus, the midrange can be appreciated with all its beauty and expression, rich in feeling and warmth, although not lacking the clear freshness that gives to female voices characteristics of, let me say it, "ethereal reality". The next higher frequency range, while not lacking the required detail, comes over as precise and at the same time soft, and makes the reproduced sound sweet, yet absolutely never falsely euphonic. The highest range is airy and accurate, an ideal completion of the aforementioned timbral structure. At the lowest end of the audio range, I can record a performance that, although not overwhelming in terms of impact and energy, is not lacking in terms of extension, with good characteristics of control and articulation, shared with the mid-low range, that is totally free of confusion and/or redundancy. Nothing to criticise about tonal coherence, everything seems blended in an harmonic and fluid way. This system does not particularly underline dynamic macro-contrasts, yet renders it effectively and in a pretty balanced and natural way. Its very good introspection and transparency, particularly in the upper ranges, make its micro-dynamic rendition very much appreciated, in a context in which even velocity seems realised for a better optimisation with the musical characteristics of this system, with an extremely notable homogeneous behaviour. Chromatic contrast is very balanced, effective and never aggressive. Pastel colours dominate, here, with good definition of the edges, yet sweetly caressed by soft and relaxing colour shadings. The holographic reconstruction's background colour is not particularly dense and dark, but this doesn't avoid the enjoyment of a stable and accurate scenic reconstruction, very well focused, with accurate dimensional ratios that, needless to say, although not rendering huge spaces, is well developed in three dimensions, with planes defined and "measurable". As already observed, the power amplifiers' heatsinks have acute edges that can scratch you when fooling around with the connections in narrow spaces and make the units difficultt to reposition (moreover, their weight is not negligible). Plus, ergonomics were to an extent sacrificed on the altar of aesthetics, and the knobs, although of undoubted scenic effect, are not particularly user-friendly. Extremely interesting stuff, those Cairns. They match an aesthetic result that objectively says something different (yet within a linear design, avoiding arguably excessive strangeness and/or extremes) in the international Hi-Fi environment, with a musical interpretation of high quality. It's a sound that, although balanced in its structure, offers timbral characterisations that I think could be better suited to the big loudspeakers from Triangle, the "partner" (oh-what-a-combination) of Cairn. Moreover, the traditionally high sensitivity of French loudspeakers would facilitate the task of the "class A" K 1 monoblocks, whose 50W would operate optimally under such conditions. Thanks to B&B Audio and its staff for their kind co-operation!